There is a growing need for energy throughout the world. This insatiable demand is being driven from an ever expanding growth from the middle class of people in emerging economies looking to avail themselves of conveniences and tools that are normally taken for granted. Additionally, the worldwide explosion of technologies of all types, including personal electronics, mobile devices, and “quality of life” conveniences, place a greater demand or strain on traditional grid or utility supplied energy sources. Where will this additional power come from, how will we fill the "gap"? WindStream believes that this gap will be addressed with the aggressive deployment of clean, renewable energy devices, designed to provide the needed energy at the origin of its generation - Distributed Energy. But single source renewable energy solutions, while clean and efficient, only work when the resource is there to be harnessed. Therefore, to maximize the available resources and provide consistent and stable energy generation, WindStream believes that a mix of technologies is the only viable answer and has created the first of its kind, fully integrated Hybrid energy solution, the SolarMill®. The SolarMill®, WindStream Technologies’ hybrid system is based on a modular, scalable, distributed renewable energy system designed and optimized for on and off grid installations. At its core is a highly efficient wind energy device, utilizing three (3) low-profile vertical axis wind turbines (VAWT) mounted on a single base. The units can be interconnected to increase a user’s energy production capability in low speed and turbulent wind environments commonly found at lower elevations. The turbines begin producing power from wind speeds as low as two (2) meters per second. With a design life of 20+ years, the turbines are silent and do not pose a threat to wildlife. In an effort to provide more consistent energy generation than a “wind only” or “solar only” system, WindStream Technologies has developed a first-of-its-kind, fully integrated, renewable energy “HYBRID” product. The SolarMill® incorporates P.V. technology within a compact footprint, creating the greatest energy generation density for any product on the market. 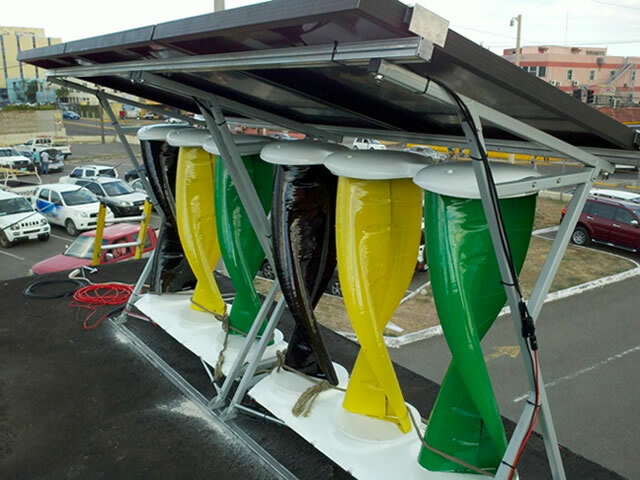 The hybrid concept of the SolarMill® is unique, seamlessly utilizing wind and solar energy generation in one unit. This allows the product to be an effective solution in markets where the natural resources available for wind or solar energy alone do not justify investment into any small wind product. Onboard each SolarMill® is WindStream Technologies’ proprietary Maximum Power Point Tracking (MPPT) electronics and solar charge controller, which maximize the power handling and generation capabilities of both the wind turbines and solar panels. This system maintains all power generation at maximum efficiency without the need for additional hardware or software. Standard solar or wind systems do not offer this ability, as this is unique to the WindStream platform. Solar energy is available... when the sun is shining. As seen above, winter months with typical reductions in solar irradiance (shorter days) bring an increased power in potential wind energy. This relationship extends to the daily cycle as well. During the mid-day, wind speeds are typically lower, but the solar potential is high. Conversely, at night winds are more typical, but there is no power available to the P.V. elements in the system. P.V. is operational only during daylight hours, which limits the overall production of a system. Wind has the potential to produce 24 hours a day, given the right conditions, but most importantly throughout evening hours when solar is not available. A hybrid approach provides a more secure and even supply of energy, and provides an energy floor in the event that a location has seasonal weaknesses in the wind resources available. There are locations that, because of seasonal variations in wind resources, do not support a wind only solution. If the production of energy during extended periods is not guaranteed, energy storage requirements to bridge the lean times are extremely expensive, and the return on investment will be excessively long. Where both wind and solar are in abundance, the products make even more sense, especially in space constrained installations. WindStream has determined the renewable resources available in 90% of the world can easily justify a hybrid energy system, not just to balance annual energy output, but to capture the available resources at the lowest cost per watt in the market for a renewable energy platform.